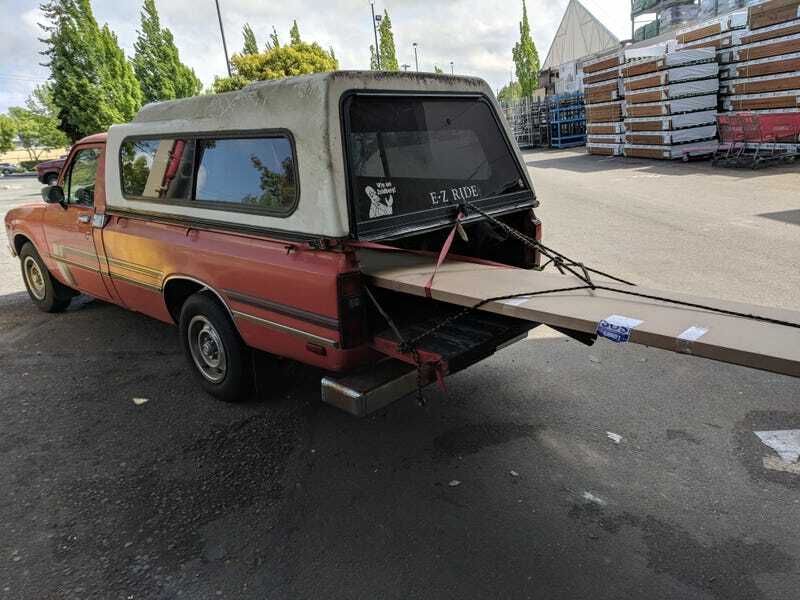 "Who needs a truck, anyway?" Again, the answer is, “me.” My dad and I picked up an installed our new countertop yesterday. It was on order last month, but wasn’t going to arrive quickly enough for when we listed the house and left town. So we left a swatch on a small board and said, “new blah blah to be installed on blah blah!” And since the people who are buying made such a loooovely offer, I was certainly going to follow through. So yeah, 142-5/8" long piece had to be custom ordered, but it only overhung my downed tailgate by 42" (all glory to the Longbed!). It’s just formica with a no-drip radius, but it replaced our pink top (also formica) which we suspected was at least 23 years old, based on old paperwork we found referring a kitchen remodel in 1985, plus visible wear that would take decades to achieve. Oooh ahhh the colors, children! The colors! Gotta do some caulking and touch-up paint, and that’s it. At least the new folks will have something tolerable to look at, before — I assume — they gut the entire kitchen with a remodel of their own.